PORTAL VITRUVIUS. 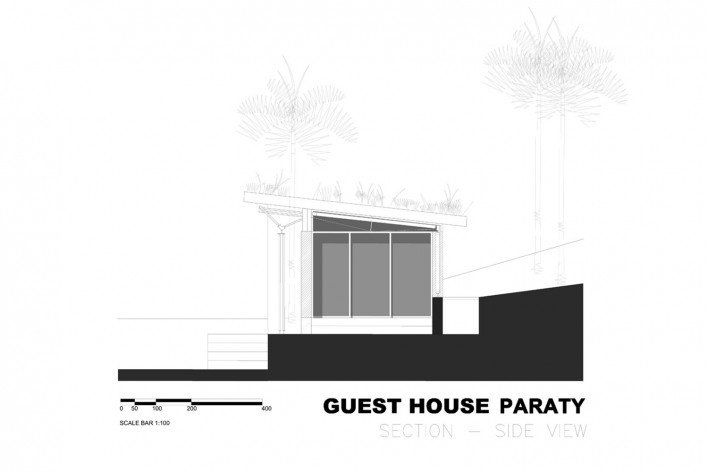 Guest House Paraty. 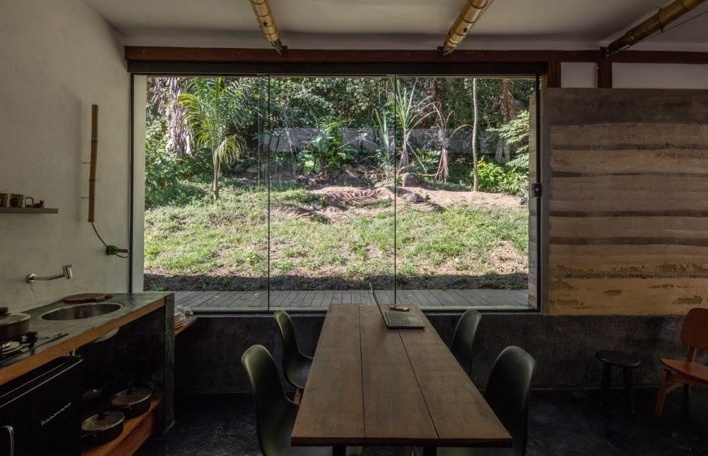 Projetos, São Paulo, year 19, n. 218.01, Vitruvius, feb. 2019 <http://www.vitruvius.com.br/revistas/read/projetos/19.218/7185/en>. 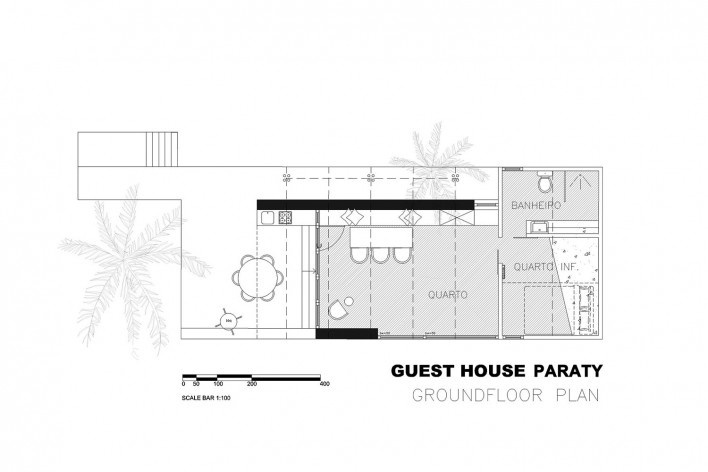 The clients required a multifunctional guest house where family and friends could stay over for a short vacation and the owners could also use it as a separate room to work or for the children to play. One bedroom with double and single bed and a sleeping couch sufficed, the bathroom needed to be comfortable but not too large. As the guesthouse is close to the residents’ house they wanted a soundproof barrier and enough privacy for both residents and guests. A large stone that was present on site was preferably integrated into the house. The building is made by the cooperants of the social building project of Camburi. The idea of this social building project was to provide training and job-development for a deprived community. 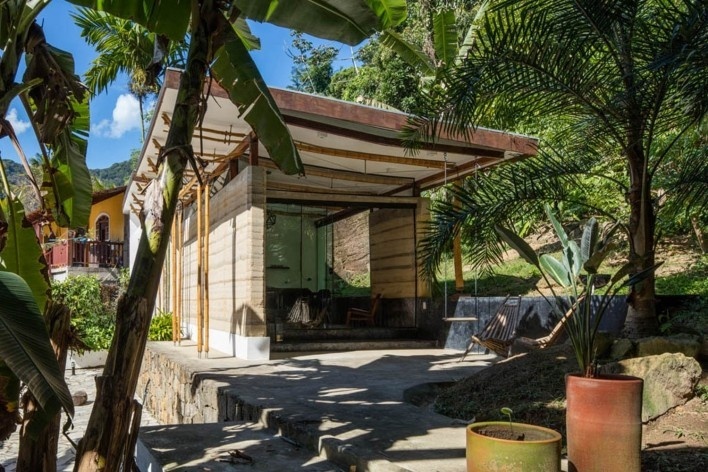 After the community center, commissions were sought outside of the village of Camburi in order to have economic return for the cooperants, of which this guesthouse is an example. 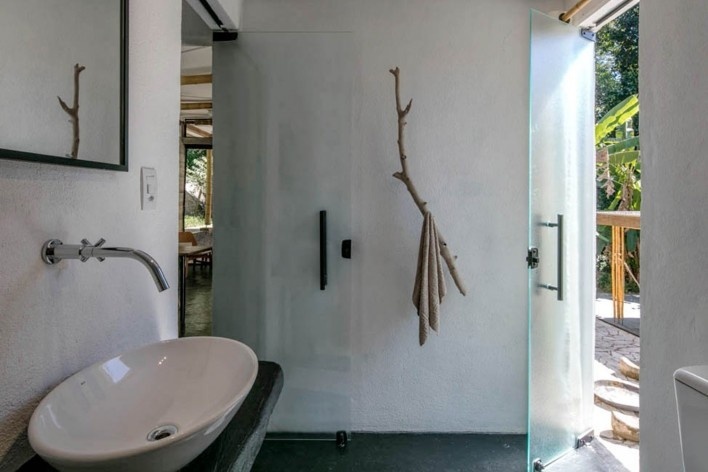 The location of the guesthouse is the north coast of São Paulo, in Southeast Brazil, with climatic conditions being tropical warm and humid. The guesthouse is less protected by surrounding structures; wind loads are hence higher, enlarging the need for extra roof weight. This is achieved by a green roof. 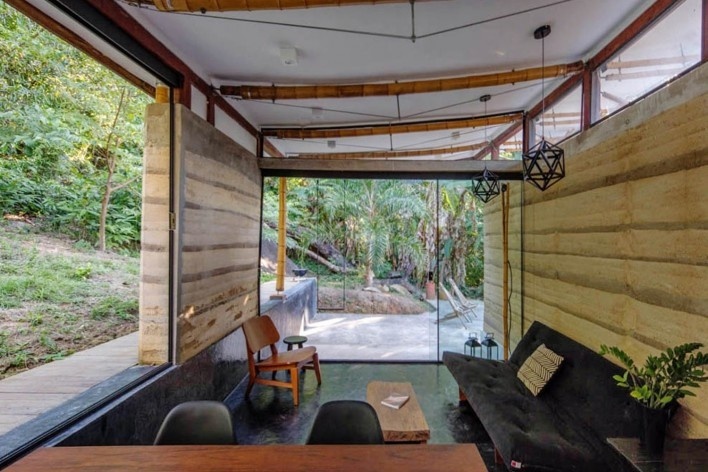 As the project location was remote from the town center and everything had to be carried to the site by carriers, the main idea was to use as little construction material as needed by re-using materials and applying natural materials extracted from the site. The 6.3m long rammed earth wall serves as noise barrier and is made with locally excavated red earth. As the terrain lies on a slope, levelling of the terrain was required thereby delivering base material without extra energy needed. The formwork used for the rammed earth was later on applied in the roof structure. The beams holding the framework together became the ring beam. The green roof was finished with locally found black earth and plants. 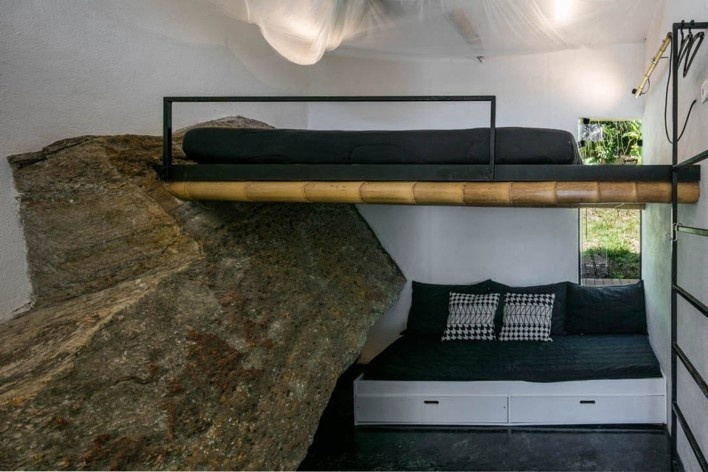 The large granite rock that was present on the left-side of the terrain was integrated into the bedroom forming half of the wall. Beyond an existing palm tree was cut out of the roof to maintain it. 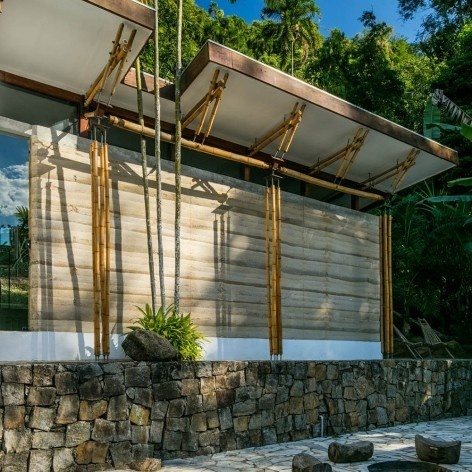 Bamboo culms were used to form the roof structure. To ensure privacy large windows were positioned opening to the back and right side of the building, the front was maintained relatively closed. 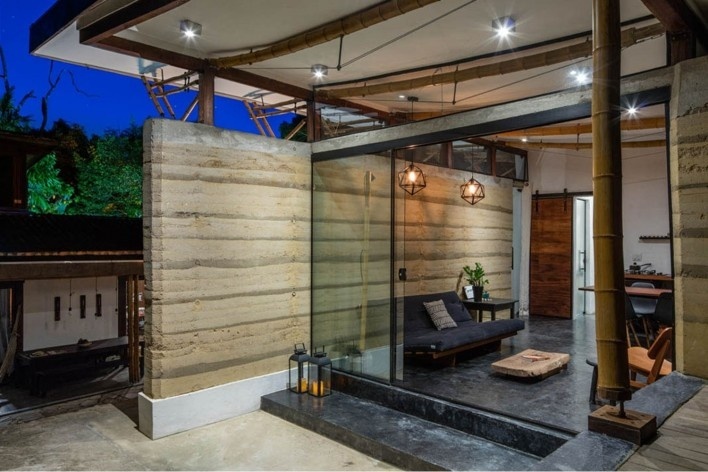 Also, the large rammed earth wall extending for another 1.70m outside the guesthouse offers a small private and covered patio. 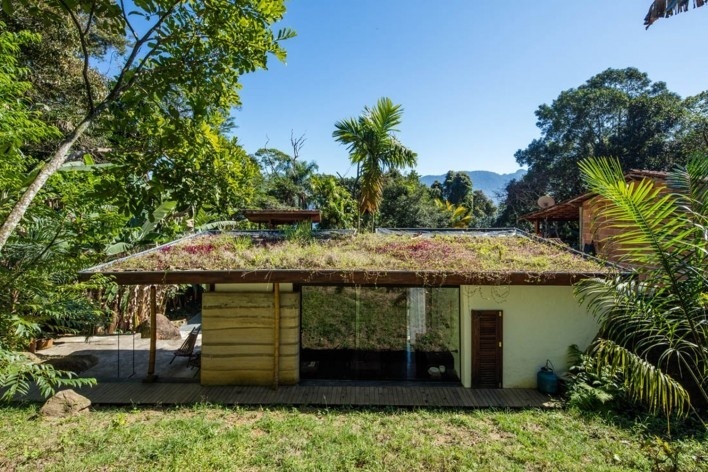 Because of its thermic inertia, the green roof marks a difference in low and high-pressure areas in and around the construction encouraging ventilation. The small windows in the front provide cross-ventilation. In every room windows can be opened up to ensure ventilation but can also be closed whenever it is colder outside. Screens are foreseen so mosquitos cannot enter when sleeping with the windows open. 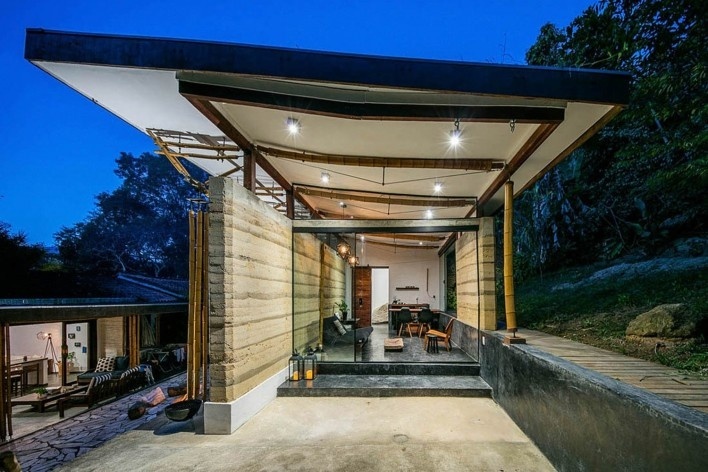 The roof has a 1.10m eave to the front and a 2m ‘free-hanging’ eave to the right side to protect the walls and bamboo structure. As stated, the terrain being situated on a slope needed to be excavated in order to obtain an equal ground level. Running rainwater from the mountain needed to be deviated through a 50cm broad canal behind the house, which later was finished off with a wooden ‘walkway/deck`. This was absolutely necessary to avoid water from entering during heavy rainfall. 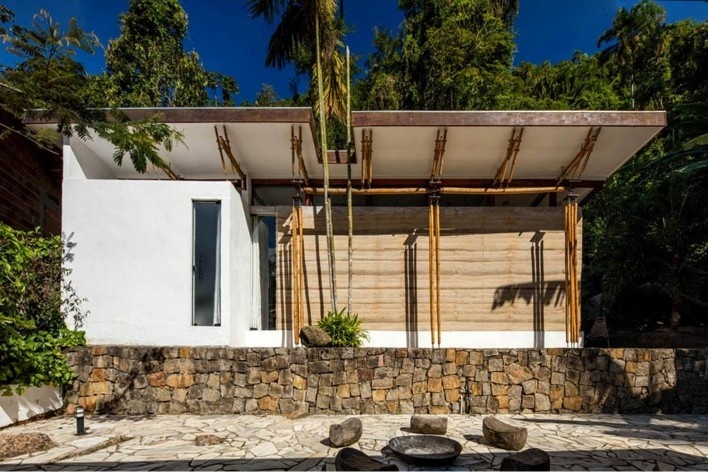 The roof structure is mainly supported by a large ring beam formed by the rammed earthen walls with a concrete end layer that continues into a wooden beam (the former reinforcement of the rammed-earth formwork) to form a closed ring beam. There are merely four columns in the construction. Three columns are put at the front of the building to support the roof eave at the front. 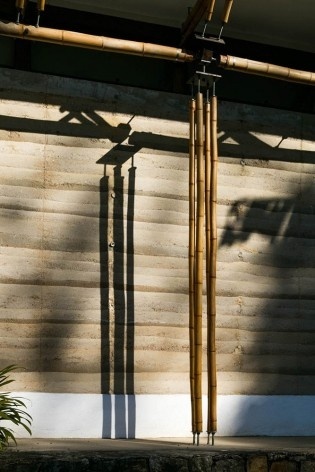 The tops of the bamboo culms are connected to a steel plate of 150mm x 150mm x 8mm and merely one steel bar goes to the joint above making the whole work as one column. 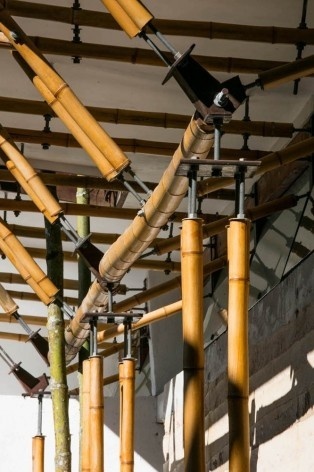 The wind-bracing and upper bamboo structure culms are connected to that one steel piece and aren´t interconnected. 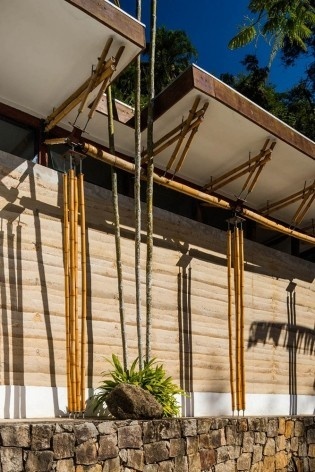 The fourth column is formed by only one bamboo culm, Phyllostachys Pubescens with diameter 120mm instead of 50mm. This last column is connected to the basis and top by a wooden plug with an outside diameter equal to the diameter of the bamboo and the inner part less than the internal diameter, wherein a galvanized wire rod 5/8 is drilled and secured with a bolt and small washer. No grout or concrete filling of the bamboos was used. The trusses can be divided into internal and external trusses. Both were separated from each other because it is complicated and undesirable to have a circular tube continuing from inside a building to the outside for the difficulty in filling the interspace. This way both trusses can also be shorter and both use the walls and columns on either side with a shorter distance than if the trusses were continuous. Outside the building, a similar truss as in the previous two cases was utilized; two small diameter bamboos interconnected in three places that also hold up the roof panels in this interconnection. These small diameter bamboos divide about 1/4 of the entire green roof-weight to the three columns (each existing of four bamboos) beneath. Inside the guest house a new technique of an inverted truss was tried. The diameter of the bamboo used was 12-14cm (also from Phyllostachys Pubescens) because the weight of the green roof demanded such diameter. The inverted truss is an innovative solution to answer to the problem of buckling/elasticity in the middle of a horizontal bamboo member. It was noticed that bamboo, like any beam, is deforming mainly in the center point, which can also be observed in a typical bending moment and shear force diagram. Where the obvious solution to this problem is making triangulated typical trusses or augmenting the diameter/section of the beam, it could be done in a more subtle way as well, by providing the inverted truss. Referring to tensile steel structures (such as ‘tensigrety’), a wire rod with tensioned cables attached is foreseen in the middle point of the truss, taking the load of the central roofpanels. 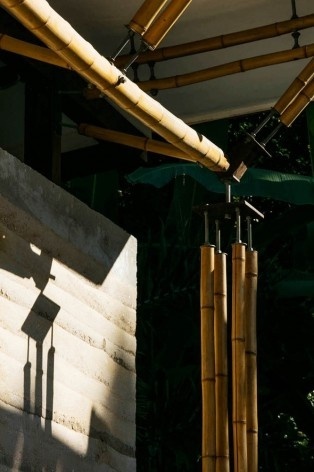 Because the tensioned cables are brought to the same point where the bamboo-truss is connected to the wall, these cannot change position in the orthogonal field, and thus also preventing deformation/bending of the bamboo in the central point (as in the typical bending moment diagram). Using this technique, a smaller diameter/section of the entire truss can be foreseen, because the bending doesn’t have to be taken into account anymore when designing the total section. Clearly, the total ‘strength’ of the truss needs to be calculated more carefully because failure would be more sudden as there is no possibility anymore of bending before failure. The result however is a ‘lighter’ look of the truss where otherwise two or three larger size diameters would have had to be connected underneath each other to form a truss. The endpoints where the truss had to be connected to the wall were attached with wooden ‘plugs’ so that the wire rod could remain centralized inside the bamboo, reducing the need for grout/cement infill. Because of the large weight of the green roof, it was decided to fill the internode below the wooden plug with a small amount of concrete. This way the wire rod could extend beyond the wooden plug and be fixed inside the grout as well, connecting it more to the entire culm. Tension bands however are necessary in these kind of trusses; the moment-forces at the endpoints of the truss are very high, making cracking nearly inevitable if the cane is not hold together with a tensioning band. With this band, the structural integrity of the circular tube-form is maintained and all forces can be divided correctly. The wire rod at the end of the truss is connected to the wooden ring-beam by a small steel plate; a hole is drilled into the wooden ring-beam that can hold the bolt used to secure the truss to the small steel plate, and this steel plate is screwed tight to the wooden beam. Hardwood is used as a connector piece. 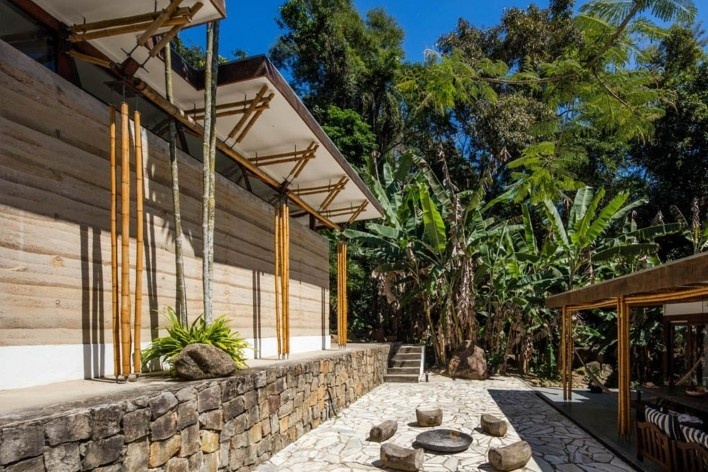 The upper bamboo culms going to the front of the roof are connected to a small steel plate on top of the wooden sculptured bird. The upper culms that go to the back are connected to a small steel plate at the back of this bird. The lateral placed wind braces are connected side-ways. A wire rod ½ goes entirely through the connector piece, bolted on both sides to secure its proper location. 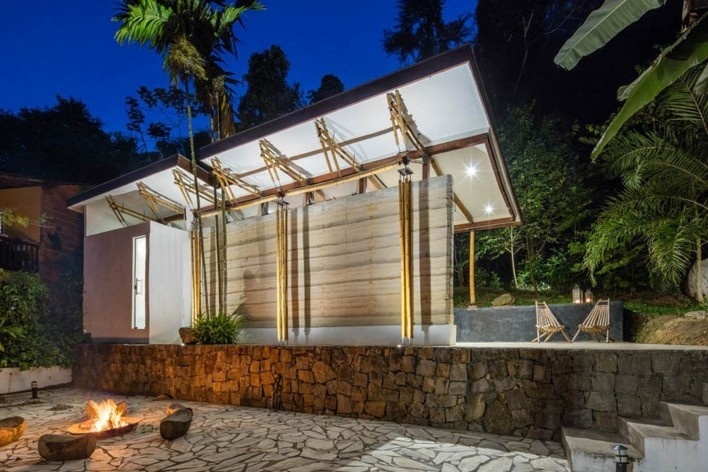 The wire rods applied in this project were galvanized in fire (artisanal). The wind-braces are connected by the same system as described above for the fourth column. This method of connecting is also applied to connect the bamboo ends of the inverted trusses to the wooden ring beam. A wooden plug is inserted in the bamboo for about 5 to 10 cm and has a thicker outside diameter equal to the outer bamboo diameter. Timber cylinders inside bamboos avoids the fragility resulting from longitudinal fracture of bamboo fibers. Filling the open end-internode of a bamboo cane also avoids water or insects entering in the bamboo, similar as a concrete infill would do. Wooden plugs have been used before, but rarely with wire rods, bolts and washers for tensioning them against another material. As for these ‘new’ kinds of joints, it can be observed that it is not safe to repeat them without proper testing. For further use of these types of joints it can be noticed that, following NSR-10-code from Columbia, it is sufficient to perform 20 times the required test on a joint to have it accepted as a ‘conform’ joint. The green roof has following layers above the truss; (1) wooden battens that hold up the (2) multiplex boards (formerly used for the casting of the rammed earth), and also serve to attach the (3) dry wall panels for finishing off the ceiling. Above these multiplex boards (4) a waterproof layer of PDA was placed with sufficient overhang to form upstanding boards at the borders. Above this waterproof layer, (5) expanded clay granulates were placed to form a water retaining buffer, divided by a (6) root proof geo-membrane from the (7) earth layer with sufficient humus for (8) plants and vegetables to grow on it. 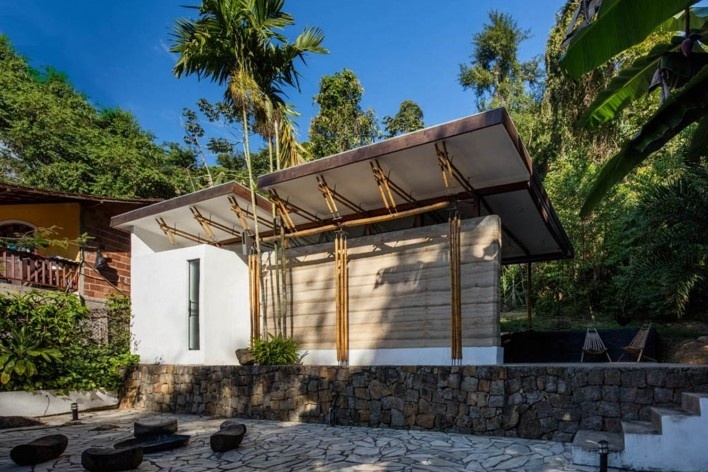 This total package equals around 82 kg/m², making the total load of the roof 4206 kg, substantially high and no problem for bamboo as a structural system.